Dobrý den, chápu dobře funkci MPPT regulátoru? : Regulátor zatěžuje zdroj (generátor) takovou zátěží, aby se odpor zátěže přibližně rovnal odporu zdroje? Umí tyto regulátory zvýšit napětí na výstupu (nabíjecí napětí) i když napětí na vstupu nedosahuje ještě nabíjecího napětí. 18. marec 2019 - 19:11 poslal Miro. 17. marec 2019 - 15:55 poslal Tommi. During the last week I've been practising some 3D printing. So, here's a mini version (1:6 or so) of my windmill. 9. február 2019 - 21:15 poslal Miro. Mám podobné sondy pre meranie elektrického prúdu, ale nedajú sa otvárať. Tieto sú praktickejšie. 7. február 2019 - 18:37 poslal Tommi. This split core current clamp is little bit easier to use compared to Allegro's ACS758. 28. január 2019 - 18:25 poslal Miro. Pekné čisté hrany! S tým sa bude pracovať dobre. 26. január 2019 - 13:32 poslal Tommi. I hate tho do anything in the freezing cold. My fingers hurt. But the signal seems to be very clean - six pulses per round. No glitches. 26. január 2019 - 8:02 poslal Tommi. But that needs ADC and some signal processing. Digital pulse measurement is much easier. My rectifier is on the ground level so accessibility is not a problem. I'll verify the circuit using my target generator today. 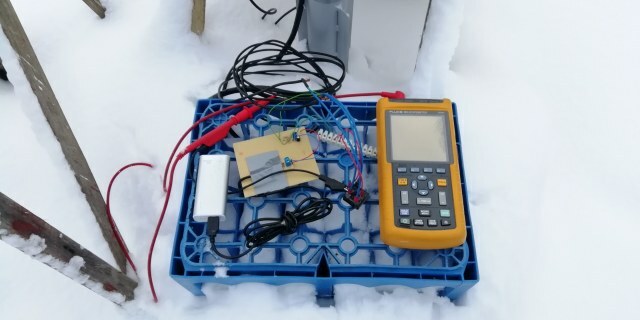 It has been very cold (-20..30C) for the last couple of weeks so I can't do much more testing just yet. 24. január 2019 - 17:56 poslal Miro. Dobrá práca! Áno, je zbytočné merať RPM generátora hallovou sondou pri generátore, keď sa to dá pohodlne z vyrábaného napätia priamo v regulátore. Niektorí konštruktéri hovoria, že sa to dá nielen z jednej fázy AC, ale aj z DC (v prípade že je usmerňovač priamo v generátore). 24. január 2019 - 0:21 poslal Tommi. The cup anemometer is very simple and contains a turning magnet and a latching hall effect sensor that changes the output state every time the polarity changes. So, there is just one digital cycle per a full round and I need to measure the time spent for one cycle to get the rpm. The actual wind measurement is low pass filtered so that I can match the result with the free running (accelerating or decelerating) rpm of the turbine just by adjusting the filter coefficient. For turbine rpm measurement I would like to avoid using yet another external hall effect sensor. So, I was thinking of feeding the rectified and down scaled output of the generator to a schmitt trigger that uses a dynamic reference that has linear dependency on the rectified generator output voltage. This way it should be easy enough to count number of poles and time spent using a digital signal instead of an analog one. 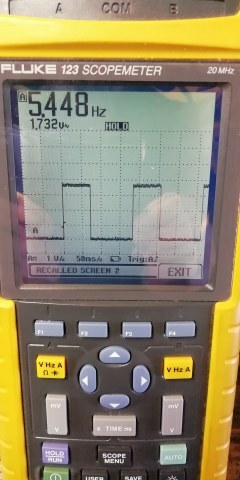 I tested using just one of the phases down scaled (2k2/33k)and rectified to get the zero crossings using op-amp LM358. With a buck converter connected to the output there will be more noise for sure. So, there is some positive feedback for additional hysteresis. The signal looks good enough at least on the test bench. I only need to know the number of poles to calculate the rpm. 15. január 2019 - 16:02 poslal Miro. Už aj číňania sa boja reverzného inžinieringu. :-) Som rád že to dobre pokračuje ďalej. 24. január 2019 - 0:14 poslal Tommi. The converter is ready for testing. Output voltage range is 9.4V..35V. I hope it is possible to scale up the output current by replacing the high / low side power mosfets and passive coolers. This is dependent on the gate charges of the mosfets and the drive capability of the control chip. The control chip was scratched to make it unidentified but I managed to reverse-engineer the feedback circuit. So, I just replaced a 3k9 resistor with the X9C103P resistor ladder that will be controlled by Arduino. The high side of the resistor divider is connected to the positive output through a fixed 100k resistor. The low side is the X9C103P plus another 3k9 in series. One nice feature of the X9C103P is that it will store the wiper position in nonvolatile memory. Still, I might need a separate solid state switch in the output to isolate it from the battery while matching the converter voltage initially. There is also a trim pot for current limiting. I do not need that in my final design because the current will be measured continuously with a hall effect sensor. I'll leave it like that for now. But it seems to add some series resistance in the output so it is better to just short circuit it at some point. 9. január 2019 - 17:42 poslal Tommi. I received rest of the missing parts today. At first I'll test how the buck converter behaves when controlled by Arduino. Control is not linear but very close to it. Voltage should be proportional to Rt / (Rt+100k), where Rt is the 10k digital pot X9C103P. I'll use circuit board test bed or veroboard for quick prototyping. Allegro's current sensor has ~100kHz max bw so it should be fast enough for this purpose. I let you know how it goes. In the meanwhile I got offer for a commercial 3kW solar panels & 3-phase on-grid inverter for 5keur. That includes all the installation and paper work needed. With current local energy price (electricity + transfer) return of investment time is about 12 years. That is if I can use most of the energy on-site. How about that? 9. január 2019 - 16:49 poslal Miro. 28. december 2018 - 16:32 poslal Tommi. I wrote most of the algorithm today and received also the cup anemometer that can be interfaced drectly to a 5V arduino. For rpm I measure duration of one 360deg (turbine, anemometer) rotation only. Since turbine stores a lot more energy compared to a cup anemometer I'll lowpass filter the latter one. TSR table will be updated whenever turbine is running without any load. I'm planning to use 15 discrete tsr values for wind speeds 5,6,...,14m/s. Granularity is 1m/s. So, when turbine decides to start charging the stored tsr values will be used as reference values when adjusting the charging current. Here is an example: Free running tsr at 10m/s equals 3.3 and I want to brake it so that instantaneous tsr drops by -10% to a new target value 3.0. So, output of the buck converter i.e. load needs to be increased in stepwise manner to reach the new target tsr. If tsr drops too much (>-15% or so) buck converter needs to decrease the output voltage. Wind speed and turbine rpm will be updated continuously. I'm not sure if this approach (fixed braking factor) works the best but it is something to start with. 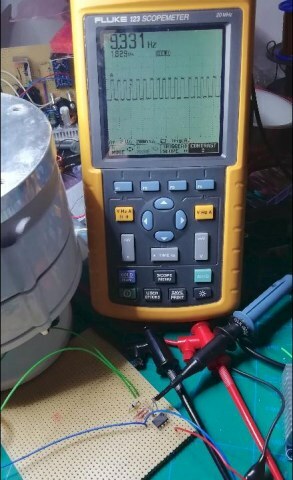 This control loop will continue for as long as set of dynamic variables (wind speed, tsr, generator output voltage, buck converter output voltage, max power output, min output power etc.) stay within predefined operation ranges. I'm still waiting for digital pots and current sensors so not much hw progress coming up during the next weekend. 27. december 2018 - 17:13 poslal Tommi. I'm not sure if it was as easy 6years ago as it is today. But nowdays web is full of good instructions for Arduino beginners. I'm usually using either 3.3V/8MHz or 5V/16MHz pro-mini (ATMEGA328) or actually some chinese copies of the original. Cost is ~2eur per module. With low energy library & sleep the current consumption may be dropped below 1mA and that is just perfect for battery and solar powered standalone devices. ADC is 10bits and max sample rate is about 1-2ksps. DAC is actually 8-bits pwm output. RPi needs about 2W continuously so it s a different story. With pro-mini you need another ftdi chip to program it via USB. Arduino IDE is free sw and it supports all variants. There are tens of ready made sensor libraries that utilize i2c, uart, pwm or spi. Note, 8MHz clock is not quite fast enough for proper 115200baud serial port. I've used pro-mini for automated green house watering system, FM radio receiver, radio clock demodulator, 433MHz mesh network tranceiver, various solar charger controllers, step motor and servo controllers, LCD and OLED display drivers, 8x8x8 led cube, rotating laser radar, CO2-level logging, automated room lightning together with microwave proximity radar etc. I was looking for a long range door bell initially and got a mesh nw instead. 27. december 2018 - 9:47 poslal Miro. 13. január 2019 - 21:39 poslal Tommi. Here's a simplified sketch. Vin, Vout and Viout go to arduino and Vc comes from arduino. X9C103P is a 10kohm digital linear potentiometer that is controlled in stepwise (up\down) manner. Output current may be limited with Rsense. Shutdown ctrl and charge pumps are not drawn. Also TSR measurement is not there but that is trivial. LT3800 can drive gates with 36mA average current (180nC * 200kHz @8Vgs). Several high side or low side mosfets may be connected in parallel to minimize Rdson. Separate drivers are needed if 36mA is not enough for the mosfets. ACS758 is a unipolar 100A current to voltage sensor based on hall effect measurement. I'll test the modified circuit first with a commercial 200W module that contains a manual output trimmer pot (detached blue part in the bottom picture). Module in the picture has 50mohm Rsense that limits the max Iout to 30A no matter what the input or output voltages are. Moreover, there is input polarity protection (N-Mosfet HY1707 in the bottom left corner) but I think that is just unnecessary serial resistance. On/Off switch is not utilized but I can connect /SHDN signal directly from arduino to the pad reserved for the switch. 13. január 2019 - 21:42 poslal Tommi. and simple enough to make it work too. Here's the sonar tube for weather protection. I need four of these in total. Tx/Rx elements will be hot glued on the top hole. I'm still waiting for digital pots (10kohm X9C103P) and hall effect current sensors (100A ACS758LCB-100U) for the controllable buck converter. I might need to upgrade power mosfets too - need to check the gate charges and drive capability of the control chip used (LT3800 or similar). 17. december 2018 - 21:53 poslal Miro. Už dovolenka skončila. Myslím, že by som radšej ukladal to drevo! 17. december 2018 - 20:57 poslal Tommi. I played with the signal processing a bit and now the reading behaves better compared to the video recording above. There is some noise in the measured distance (±4mm@1m) but I don't know what is the source. It may be due to air turbulences or multipath effects or someting else. So, I decided to validate the distance measurement only if the same value is repeated 3 times in a row. In addition to that I added some capacitance to the power input. The resulting wind speed is averaged using FIR and the result is given as a floating point number. With one tranceiver per axis the initial distance of the tx and rx modules need to be set exactly apart from each other. 3mm equals 1m/s wind speed at 1m and if the distance is not correct there will be some offset in the wind speed reading as well. It might be possible to use duplicate rx and tx tranceivers in opposing directions and use the perceived distance delta for measurement but better option is just to calibrate the distance measurement in still air. I'll 3D print some tubes for weather protection and test the device outdoors next with temperature compensation added. I'll get a cup anomometer too for reference. 15. december 2018 - 10:49 poslal Tommi. Yes 1m/s accuracy is not great but this is a really low budget anemometer. Total price will be less than 20eur. Accuracy is actually dependent on dimensions. With 2m Tx to Rx distance accuracy is 0.5m/s (4m: 0.25m/s and so on). That is in theory. Let's see - I'll test it. It may be possible to improve wind speed measurement just by averaging multiple samples. But 16MHz Arduino pro-mini has only 4us resolution. That equals 0.5m/s for 1m distance. 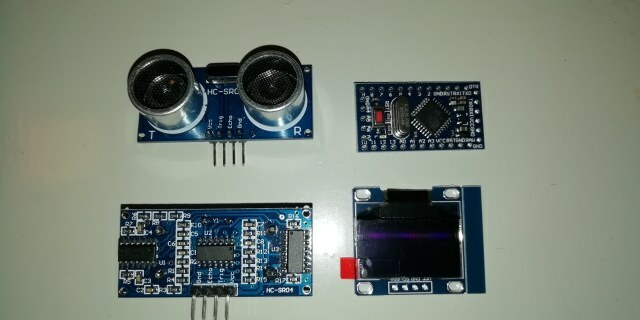 For smaller distances or improved accuracy I need to use more powerful micro controller. Teensy provides Arduino compatible devices up to 180MHz clock frequency (Teensy LC/3.2/3.6 pictured below) with much better clock resolution as well. Firewood provides heating twice - the 1st time comes from the exercise involved :) Happy holidays! 13. december 2018 - 22:47 poslal Miro. Tommi, neviem, ak by bola presnost 0,1 m/s, povedal by som fajn. 1 m/s sa mi zdá predsa len trochu veľa. Hlavne ak si to dám do súvislosti s výkonom vetra, ktorý rastie treťou mocninou rýchlosti. Tam potom budú oveľa väčšie rozdiely. 13. december 2018 - 21:54 poslal Tommi. bit too clumsy with all the tuned discrete components needed. like Teensy 3.6 instead. But I haven't really thought that yet. I've used ultrasonic SR-04 modules for range finding. According to some others SR-04 accuracy is about 3mm in the full measurement range 3cm...200cm. t_delta_3mm = 0,000008824s this is the time spent for 3mm distance. 1m / 340m/s = 0,002941176s this is the time spent for one meter distance. i.e. accuracy should be about 1m/s when using SR-04. I think that is good enough resolution. where tempAir is temperature in Celcius. 10. december 2018 - 5:12 poslal Tommi. Anemometer averaging window should be matched with the turbine inertia. It is possible to optimize the averaging window by selecting averaging time that has the best correlation with turbine rpm. This can be automated too. 10. december 2018 - 0:20 poslal Miro. Len jediná poznámka: bude potrebné veľmi dobre premyslieť meranie rýchlosti vetra. Údaj o okamžitej rýchlosti vetra bude pri turbulentnom alebo nárazovom vetre dávat nesprávne pokyny. V spojitosti so zotrvačnosťou vrtule by bolo riadenie veľmi nepresné až chaotické. Asi správne zvolený časový úsek a priemer hodnoty vzhľadom k zotrvačnosti. 9. december 2018 - 17:34 poslal Tommi. 1. Anemometer for instantaneous/averaged wind speed measurement. 2. Rpm information from the generator. 5. Rectified generator rms voltage measurement. 6. A programmable Buck converter. 8. Battery voltage measurement for overcharge protection. 1. and 2. are used for calculating TSR. 3. and 4. are used for calculating load power. 5. will be used for both cut-in control and rpm limiter together with 7. 6. will be used for load matching. I assume TSR drops a bit after connecting the braking load (6. or 7.). But I shouldn't use too heavy load because that will drop the overall efficiency too -> load acts as negative feedback in the system. Perhaps I could use some fixed TSR percentage as load factor (LF). Moreover, I assume TSR is not fixed but it will change as a function of wind speed (1.). A. Collect some coarse free running TSR data as function of wind speed without any load (6. or 7.). This data may be extended and fine tuned when ever needed and possible. B. Set some high and low rpm limits. C. Based on current wind (1.) and TSR table created in step A we have understanding on the expected free running TSR at different wind speeds. If the load hasn't been connected for some time we can fine tune the value in the table. D. If the turbine rpm (2. or 5.) exceeds the low limit add some load until the measured TSR is dropped by LF compared to the value in step C.
E. If the TSR drops more than LF decrease the load. It should be possible to use a PID controller here but let's start with something simple first. F. If the rpm exceeds the high limit increase the load. G. If the rpm drops below the low limit switch the load off completely. H. If battery voltage exceeds the high limit change load to dummy. Otherwise use battery as load. I. Update & store the measurements and go back to step C.
Steps in the loop take no more than 1/20s. Load Factor doesn't need to be fixed. But it is easier to start with a fixed value. I'll test that in matlab/octave first. 8. december 2018 - 21:50 poslal Miro. Ano ultrazvukový anemometer by projekt veľmi predražil. Už som sa o to zaujímal (myslím, že som videl aj tú konkrétnu stránku čo si uviedol), pretože som mal v pláne nejakú elektroniku pre bezpečnosť turbíny. Spustenie v použiteľnom vetre a hlavne zabrzdenie v extrémnom vetre. Zatiaľ som sa k tomu nedostal. 8. december 2018 - 20:45 poslal Tommi. But cost is too high for a hobbyist. Maybe I'll experiment some de-icing with a 3D printer. I'll write some notes about the controller algorithm tomorrow. 8. december 2018 - 19:04 poslal Miro. Tommi, keď sa ti to podarí, mám určite záujem o niekoľko kusov! Ak bude regulátor udržiavať regulovaním záťaže turbínu v konštantnom TSR, aj účinnosť, ktorá je na TSR priamo závislá bude v tomto rozsahu konštantná. Ak hovoríme o vrtuli ako pohone. Inak môže vyzerať účinnosť generátora pri rôznych otáčkach, čo ale ovplyvní cely systém. Našťastie v prípade generátora zmena účinnosti nemusí byť tak katastrofálna ako v prípade veterného stroja. Regulátor musí zabezpečiť, aby nedošlo k podtočeniu turbíny a prílišnému poklesu TSR. Bolo by úžasné, ak by to vedel zmerať. Myšlienka je dobrá, realizácia bude náročná a držím palce aby sa podarila. Program bude musieť sledovať súčasne veľa parametrov, navyše vzájomne sa ovplyvňujúcich, a to asi nebude vôbec jednoduché. Ja mám s tým len jeden problém, a to je spoľahlivosť mechanického anemometra. Občas sa stáva, že v zime zamrzne, alebo na jeseň ho zabrzdia lietajúce pavučiny. Je potrebné programovo ošetriť aj takúto poruchu. O učiacom regulátore sa viedli debaty aj na inom fóre - mypower.cz (primárne je to fórum o fotovoltaike). Tu je dobrá odpoveď k téme (v českom jazyku). 6. december 2018 - 22:46 poslal Tommi. I'm planning a low cost DIY controller for my VAWT generator. That will be based on pre-planned Vin vs. Pout table. As a result, the output power will be a function of input voltage rectified from the alternating phases. Most buck converters are controlled by inverting feedback (Vfb). For example, one common commercial module uses Linear Technology's model LT3800 as a controller circuit. LT3800 uses internal positive reference 1.23V that is compared with the negative feedback. So, if I want to have 12.3V as output I need to divide the output 1/10 for Vfb input. Max input voltage of LT3800 is only 60V so it may not be enough for all generator models. But it is good enough for my generator. To make it work I need to connect a digital potentiometer from the regulator output to the Vfb contact. In addition, instantaneous output power needs to be measured. That can be done using Allegro's hall effect current sensor and an analog to digital conversion. Measurements and control logic will be running in a micro controller. Arduino Pro-mini is enough for this purpose. I think it is possible to make the Vin vs. Pout table self adjusting to mimic MPPT above some threshold Vin. But for that I might need additional information about the wind speed. is the Darrieus efficiency fixed too as a function of wind speed? 13. október 2017 - 11:33 poslal Miro. Fakt neviem. V popise sa nedocitas, ci ma alebo nema moznost nastavit krivku turbiny. Ked nema, tak je to nanic. 13. október 2017 - 7:25 poslal yano333. Uz som ho niekde videl aj v prevádzke asi. 12. október 2017 - 11:00 poslal Miro. 12. október 2017 - 8:55 poslal yano333. chystam sa nieco kupit na 12V. CO poviete na toto? 6. máj 2015 - 14:31 poslal Miro. MPPT solárny regulátor nie je celkom to pravé pre veternú turbínu. To čo z neho naozaj potrebujeme je DC-DC menič, ktorý obsahuje. Samotná MPPT regulácia bude najčastejšie málo. Podrobnejšie je to popísané v článku Potrebujeme MPPT regulátor pre veternú turbínu? Pozri si aspoň jeho druhú časť. Zároveň v diskusii k spomenutému článku sa píše aj o druhoch regulátorov - Buck a Boost, čo je tvoja tretia otázka. Takže regulátory zvyšujúce výstupné napätie (Boost) existujú.